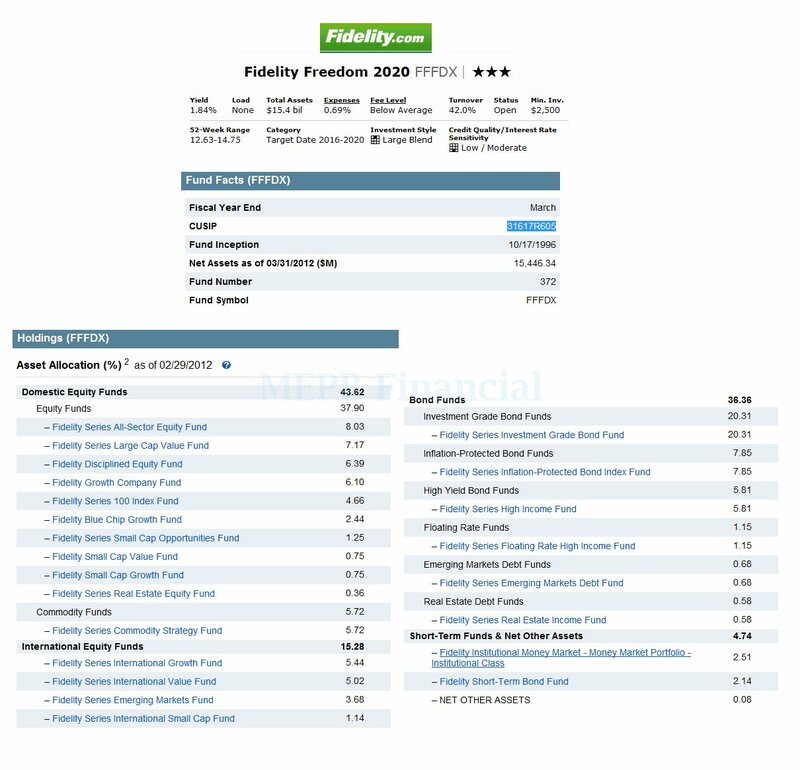 Fidelity Freedom 2020 fund is part of Target Date Mutual Funds. This target date funds are available to investors who invest in their retirement account such as 401k, traditional IRA, Roth IRA, 403b, etc. This balanced fund automatically adjusts its assets as the time progress (i.e. bonds portion will be higher as time progress). You may get the fund review below. The investment aim of Fidelity Freedom 2020 fund is to provide high total return until its target retirement date. This mutual fund invests in a blend of underlying Fidelity domestic equity funds, international equity funds, bond funds, and short-term funds. It will use a moderate asset allocation strategy designed for investors expecting to retire around the year 2020. It uses an asset allocation strategy that becomes increasingly conservative over time. Chris Sharpe has been managing this balanced fund since September 2007. It has an annual expense ratio of 0.69%. A part of fund of fund, the annual holdings turnover as of March 2012 is 42%. The latest dividend distributed was in December 2011 ($0.23%). The 12-month dividend yield is 1.85%. This Fidelity fund has total net assets of $15.53 billion. The fund CUSIP is 31617R605. Morningstar has ranked this target date 2016-2020 mutual fund with 3-stars rating. It has 7.01% of YTD return. The best 1-year total return ever achieved so far was in 2009 with 28.86%. Since its inception, the fund has recorded in 10 years of positive return and 5 years of negative return. Based on the load adjusted return, the fund has returned 2.08% over the past 1-year and 5.12% over the past 10-year. The 3-year beta is 1.15. This is a no-load fund, so there is no management fee and no sales charge fee. To invest in a regular brokerage account, you will need an initial investment of $2,500. You will only need an initial investment of $500 for retirement account. You can buy this hybrid mutual fund from 74 brokerages such as Fidelity, T Rowe Price, JP Morgan, Federated Trust Connect, Schwab Retail, EP Fee Small, TD Ameritrade Inc, E Trade Financial, etc. 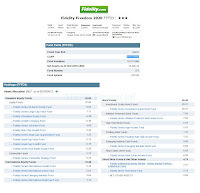 As of February 2012, the top 4 sectors of this FFFDX fund are Domestic Equity Funds (43.62%), International Equity Funds (15.28%), Bond Funds (36.36%), and Short-Term Funds & Net Other Assets (4.74%). The top 5 mutual funds in its holdings are: Fidelity Series Investment Grade Bond Fund (21.19%), Fidelity Series Inflation-Protected Bond Index Fund (8.07%), Fidelity Series All-Sector Equity Fund (7.71%), Fidelity Series Large Cap Value Fund (7.06%), and Fidelity Series Commodity Strategy Fund (5.93%). Stock Market Volatility Risk, Interest Rate Risk, Foreign Investment risk, Leverage risk, bond market risk, etc.